Raydelto was born in Santo Domingo, the capital of Dominican Republic, as the the son of the lawyer Edgar Hernández and the psychologist Luisa Perera. His first language is spanish. Lived 8 years in San Pedro de Macorís, a small town of the country, where he got in contact with a PC for first time, in the UCE University when he had 6 years old. 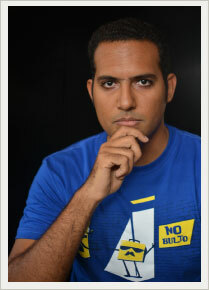 Raydelto attented to the PUCMM University from 2001 to 2005, where obtained a major in Systems Engineering. His interest in computer began by the motivation of his older brother, Yumaro Hernández, who began his studies of System Engineering by the time Raydelto had 8 years. Yumaro taught him programming skills gained in his career making Raydelto able to write programs in BASICA for DOS before 10. After this initial help by his brother, Raydelto already knew when he had 11 that he would dedicate his life to software development. In 2002 was elected as the President of the student comitee of his career, position that mainteined until his graduation in 2005. Because of this began his contact with Free Software and Open Source Movements, because he had inherited the responsability of organizing the annual event Expo Linux, which was created by Luis Santiago and Frank Santana. Motivated about free software topics, became a member of the local free software community abiertos ( means open in spanish ) since 2002. While he was student he was tutor of C and Java technology, and also was an official instructor of the Java Programming Language Curriculum from CISCO Academy. At 2005 created his own software development enterprise (Soluciones GBH) with two parters: José Bonetti and Andrés Gadala-María. At the same year became a Instructor of the Las Américas Institute of Technology (ITLA), the highest technology center of the country, sponsored by the government. A year later became the first official Director of the Software Career at the Center. By July 2006 Raydelto met , and was the host of Richard Stallman, a programmer from the time of the MIT hackers (70's). Programmer of the GNU Operating System, the EMACS editor and founder of the Free Software Fundation. In January 2007 left the direction of the Software development carreer and worked for Verizon Business USA, until December of the same year, when decided to start a new software development company: Ágiles Soluciones Tecnológicas (AST). Since november 2006 until april 2008 worked in the ITLA's radio show named Acceso Directo. Now he still being software development instructor and develops software independently for his new company (AST).